(Bloomberg) -- U.S. Treasury Secretary Steven Mnuchin said that if China presents enough trade concessions to President Donald Trump, there’s a chance the administration may lift all tariffs. “Everything is on the table,” Mnuchin said early Tuesday during an interview on Fox Business Network. 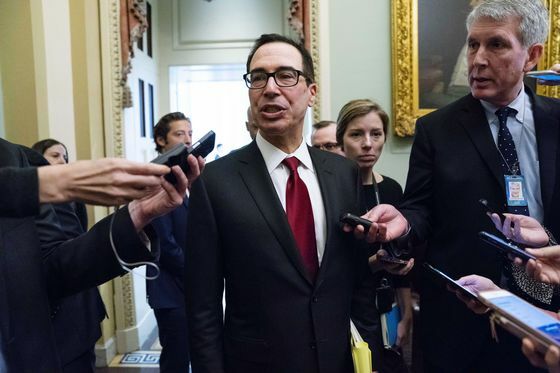 The Treasury chief is set to meet with top Chinese officials in Washington on Wednesday and Thursday alongside U.S. Trade Representative Robert Lighthizer about a month before the U.S. is set to escalate its trade war with China with fresh tariffs. China is facing added urgency to end the trade spat amid the weakest domestic growth since 2009. Divisions remain within Trump’s trade team, with hawks including Lighthizer and National Trade Council Director Peter Navarro seeking tougher terms from China, and Mnuchin and White House economic adviser Larry Kudlow prioritizing preserving U.S. growth. Mnuchin pushed back on speculation that the U.S.’s latest actions against Huawei Technologies Co. were tied to the trade talks. U.S. prosecutors on Monday filed criminal charges against Huawei, accusing the Chinese company of stealing trade secrets and committing bank fraud. But Mnuchin insisted the case was separate from trade negotiations, adding that he wasn’t aware in advance of Monday’s charges. In a sign of the importance the White House is placing on the talks, Trump is expected to meet China’s top trade negotiator at the end of the week. In addition to U.S. demands for structural changes to China’s economy, the latest round of talks will cover Beijing’s pledge to buy more American goods. The non-partisan Congressional Budget Office on Monday painted a different picture of the U.S. economy. Budget deficits are seen widening and economic gains will be “muted,” slowing to 2.3 percent for this year and 1.7 percent in 2020, the CBO said, adding that the burst of economic growth in 2018 fueled by Republican tax cuts will fade in the coming years, while tariffs imposed by the Trump administration may dent the economy and hit business confidence. Kudlow on Monday disputed CBO’s forecasts.